"Rapunzel, Rapunzel, let down your hair!" If you hear this every day, you must have some pretty long locks. Either that, or a lot of people around you don't know what that story is about. Rapunzel may be famous for her insanely prolific hair follicles, but she was also apparently a really good singer, and was quite a whiz with knitting needles. But yes, her claim to fame was her really long hair that was strong enough for someone to climb up. For those of us that don't have naturally body-length hair that can double as climbing gear, there's still hope. 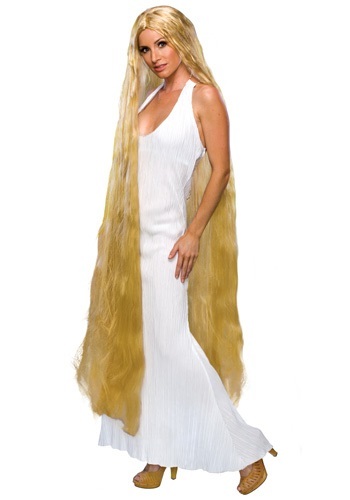 Just slip into this majestic Rapunzel Wig, and let the long, golden mane work its magic on your costume. This hair may not be able to let you escape from a prison tower like Rapunzel, but it's much easier to walk around with (and much easier to brush!!). This whimsical hairdo makes a great addition to any fairy tale costume, or any costume that may get you stuck in a tower without a way down!